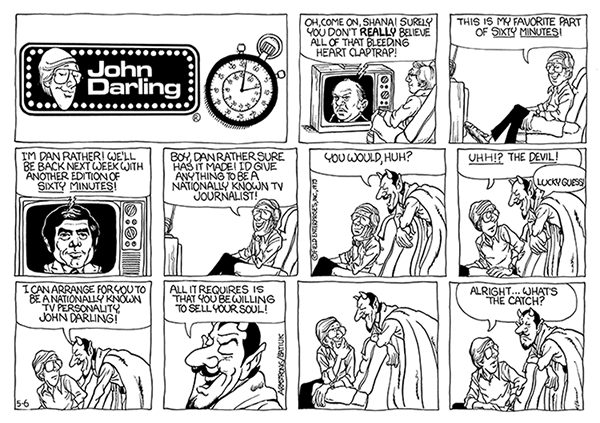 Given that John Darling was easily the most topical of the three strips I created, I can see that I’ll have to be putting a lot of things into context as we roll along. In this case, the throw-away panels on top refer to political liberal Shana Alexander and conservative James Kirkpatrick who used to duel and the end of Sixty Minutes back in the seventies. The bottom part with John, the media personality, selling his soul to the devil is pretty much timeless. It seemed like forever, but the June issue of The Flash finally arrived. So let’s get right to the best part. 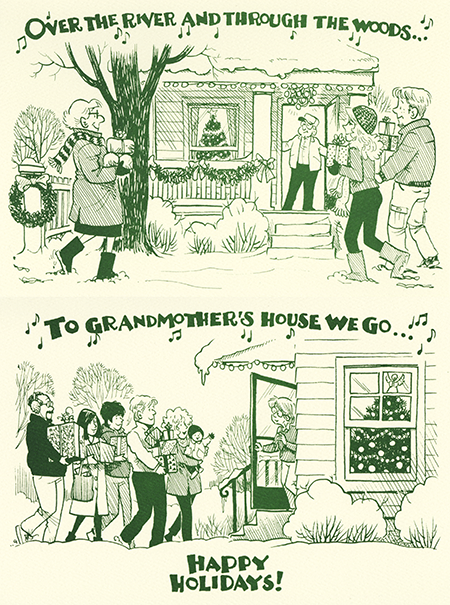 There on the first page of the Flash Grams under the title Flash Art Appreciation was my letter, name spelled right and everything. It was followed by Julie’s reply awarding me the art to The Doomed Scarecrow. When you’re twelve years old, it doesn’t get much cooler than that. It was like being admitted into a very exclusive club. You’d caught the eye of Julie Schwartz and just for a brief moment he knew who you were. I’d already decided that we were going to be meeting again one day when I turned up on the doorstep of DC Comics looking for work as a writer and artist. I wasn’t alone. The alumni from those letters pages who ended working as writers or artists in comics and elsewhere is fascinating and a testimony to Julie and the way he encouraged and inspired his readership. I’ll try to make a point of spotlighting them as we go along. Sadly, when I finally did arrive on DC’s doorstep it wasn’t Julie that I talked to, but I did get a chance to thank him at a comic con in Cleveland many years later. Still later, at a post comic con party at my house, I went up into my studio to find Julie holding court and regaling a rapt group with stories as he sat with his feet up on my drawing board. All I could do was smile. He’s the one man I’d let put his feet on my drawing board without hearing a peep from me. And that issue wasn’t too bad either. It featured the return of the Trickster with a nice recap of his origin for those of us who were encountering him for the first time. Loved the over the top costume and it made for a colorful contest with the Flash. I liked the second story, The Secret of the Stolen Blueprint, even more. It involved the Flash taking Iris to his class reunion at Sun City University where he meets his former roommate, Pete. Pete is a scientist/professor at the university and has had some important blueprints stolen. The Flash not only recovers the blueprints from some spies, but also plays cupid by getting Pete to propose to his girlfriend. The art is by Infantino and Anderson and includes an amazing full page panel showing the Flash using his speed to talk to Pete as Barry and the Flash at the same time. 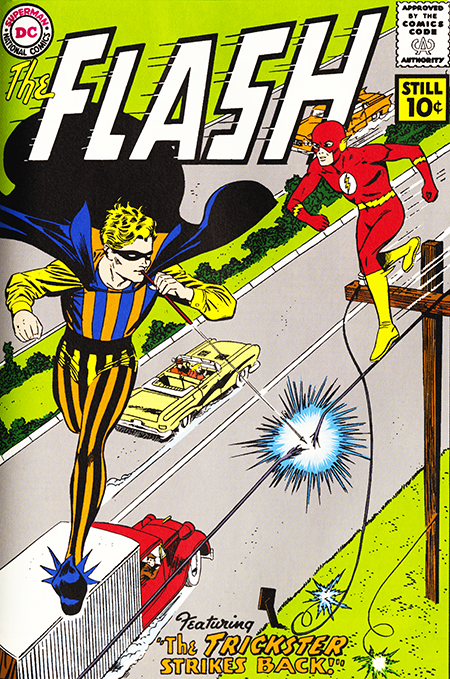 Another fascinating advancement by author Broome in the Flash’s super-speed powers. Without a super villain in sight, this was still my favorite story because of the advancement in character and the more relatable human story it told. As much as I loved a good superhero story (still do), this type of story was more and more beginning to become my favorite.